This week we talk to Disney Design Group artist Thomas Scott. 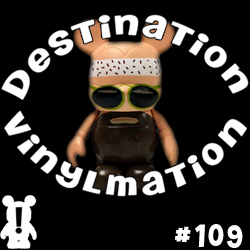 We get a glimpse at what goes into the making of a Vinylmation line and where he sees the future of the hobby. We also get to know more about him as an artist. We also of course deliver the news of the week and the latest release dates and events. Great Interview guys…. Great to hear Park 12 & 13 are coming at some point…. Shame he couldn’t give us much information on future releases but i understand they like to keep things underwraps…(maybe too much!) Plus a scoop on some more D-tour… looking forward to all the new stuff coming soon in Vinylmation, as he said, it’s changing (like I’ve mentioned myself)..
As you said, he doesn’t have much to do with the Disney Store team. I know I’d love to hear from them too . Thomas Scott could have been a running back on any great football team because he is so elusive!! It’s good to hear that there are some exciting things ahead for Vinylmation in general. Hopefully, for the better. Would have liked to have heard more info on Park Starz since they were his invention. Sounds like vinylmation is going to explode in many directions. That is a good thing!! As always, a great interview Nick. Thank you. They are very restricted as far as details of yet to be released products. Great interview with Thomas Scott guys! Looking forward to maybe hearing from Disney Store artists in the future! great episode! cant wait for vinyl madness! Great, great episode! Well done!! Great espisode! Awesome interview with Thomas Scott. I can’t wait for the future of Vinylmation. He seemed very excited with what was coming out in future releases. Glad to hear of more Parks series being released. I really hope it includes a Vinylmation representing Splash Mountain. That would be at the top of my list! Yes, the way they are doing things, it wouldn’t surprise me to see a Marvel set released with a movie.